Welcome to the May edition of the Leadership Development Carnival! 1. A blog "Carnival" is typically a collection of recent blog posts organized around a common theme, in this case, leadership development. Although there are lot's of places a reader can go to get aggregated free content these days, my readers still seem to appreciate the monthly Carnival collection. Bloggers like them because it's an opportunity to reach new readers. 2. I've been hosting the Carnival for a few years, and for the last couple years, have shared the hosting responsibilities with other bloggers. 3. I have a mailing list of over 60 leadership bloggers that I know and respect that I go to each month and ask for their best recent post. I usually get about 30-40 posts, that are sometimes organized around a theme. 4. I'm always looking for new contributors - if you are interested, send me an email with a link to your blog and I'll consider adding you to the list. I'm at danmccarth at gmail dot com. So here's the May edition - no theme - just all good stuff! Art Petty presents The Cruel, Bitter And Crushing Taste of Dump Truck Feedback, from his Management Excellence Blog. Several metaphors were massacred in the writing of this post! Sharlyn Lauby from HR Bartender, presents What Creates a High Performing Organization. Does social media play a role in developing high performance? This post explores the concept. I had a chance to meet Sharlyn recently at a conference, and she is the real deal! Lolly Daskal is very passionate about the power of heart-based leadership, the value of personal integrity, helping people achieve their potential, and the importance of making a difference in the world. She's also been a consistent Twitter supporter of Great Leadership. Here's The Truth About Leadership, from her Lead from Within blog. Wally Bock from Three Star Leadership presents Magical Bosses. Great bosses get results that often seem magical. But there's method to the magic. Last month's Carnival host, Tanmay Vora, from QAspire Blog, presents Lifelong Learning: Lesson from a Cab Driver. "I once heard Tom Peters saying that if you are a business traveler, you learn the most not from the corporate executives but from the cab drivers. You really get a perspective about life. I experienced it first-hand!" Jesse Lyn Stoner from Jesse Lyn Stoner Blog presents Five Pitfalls to Avoid When Identifying Team Values. If you want to identify the right team values and ensure they are lived, avoid these 5 common pitfalls. Jennifer V. Miller from The People Equation presents The KISS Model of Leadership Development. 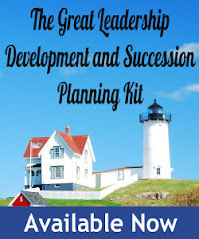 Worn out by all the complex leadership development systems in your company? Jennifer Miller gives leaders a respite with a “keep it simple” approach to daily leadership development. Mary Jo Asmus from http://www.aspire-cs.com/, presents What’s Best for Them? Managers everywhere are frustrated that their best employees aren’t moving ahead with the wonderful development suggestions they’ve been given. This post explains a simple way to change this. Tanveer Naseer from Tanveer Naseer, presents How Are You Helping Your Employees To Be Your Organization’s Heroes? David Burkus from LeaderLab presents Why Most Managers Are Ineffective? How can we help leaders deal with complexity and respond to it with ethical behavior? Linda Fisher Thornton, from Leading in Context offers Leading Ethically Through Complexity. John Hunter from Curious Cat Management Improvement Blog presents The Customer is the Purpose of Our Work. The quote from Gandhi embodies the spirit of servant leadership. Look at the purpose of the system and see how you can help. See others as the reason for your role existing not as a bother to be suffered through. Miki Saxon from MAPping Company Success presents Ducks in a Row: When Stupid Invades the Culture. What is going on; are people really getting stupider? No matter the arena, business, political, religious or role models in general, the operative question these days is ‘What were he/she/they thinking’. Lynn Dessert from Elephants at Work presents Why does executive coaching take so long? The urgency to get it done quickly often produces poor coaching results. When your personal readiness and the coaching process are aligned, your goals can be reached. Guy Farmer from Unconventional Training presents The Overlooked Leadership Tool. Leaders sometimes forget that their employees have a wealth of ideas to deal with challenges in the workplace. Discover a valuable tool to tap into that brain power. Nick McCormick from Joe and Wanda on Management presents Benefits of Working On-line. Debra Benton, author of The Virtual Executive, shares benefits and offers managers advice for using on-line communications. Tim Milburn from TimMilburn.com presents How To Be A De-Motivational Leader. I wrote this post as a tongue-in-cheek look at what NOT to do as a leader. Unfortunately, I've noticed how many leaders do these exact things. Reading about de-motivational leadership is funny. Working for a de-motivational leader...not so funny. Joel Garfinkle from Career Advancement Blog presents 5 Surefire Tips for Job Advancement . Professionals who want more from their careers have to seize the initiative. Many of these individuals follow a series of intentional steps to career success to secure promotions. Bernd Geropp from More Leadership, less management presents How are correct decisions made? Many entrepreneurs and senior managers tend to work around the clock, but take too little time for the real leadership tasks. Anna Farmery from The Engaging Brand presents My Auntie's 10 Steps to Social Media Measurement. Lisa Kohn of Chatsworth Consulting Group, presents What is your greatest strength? on The Thoughtful Leaders Blog where she talks about the importance of leaders acknowledging and building upon their strengths, and choosing to use them thoughtfully. Mary Ila Ward from Horizon Point Consulting, presents Is Your Way the only Highway? In this post, the author discusses problems with the my way or the highway mentality and introduces ways for leaders to avoid stifling creativity and innovation in those they lead. Chris Edmonds from Driving Results Through Culture presents Out-of-the-Box Thinking About Corporate Culture. " I discuss the unique "no-hour workweek" utilized at investment startup Betterment. They've found a terrific approach that honors the hectic, 24/7 pace of a startup and combines the realities of work/life balance – team members share the load, demonstrate trust & respect of each other, and don't miss a trick. Very interesting culture"
Carol Morrison from i4cp’s Productivity Blog presents Executive Leadership: Trending Toward Trouble. Jim Taggart from Changing Winds presents Thriving in a Boundaryless Organization: How People Can Make a Difference. Finally, we'll end with a last second submission from my friends at Talented Apps: Mark Bennett from TalentedApps - presents The New Crucible of Leadership. The old ways that leaders got to be in their position are being slowly eroded. Is that such a bad thing? That's it for this month's edition! The next edition of the Leadership Development Carnival will be on June 3rd, 2012, hosted by Laura Schroeder from Working Girl. It was great meeting you Dan! Hope our paths cross again real soon.